Founded by French settlers and commonly known as the Pearl of the South (La Perla del Sur), Cienfuegos is a popular Cuban destination. This is a calm city by the water, although it has no beaches nearby as it sits on the edge of a natural lagoon inland. Tourism in the seaside city of Cienfuegos is burgeoning, however, as there are plenty of sights to check out. It also comes with a bustling pedestrianised shopping area that leads into the main city park / square (the Parque Jose Marti), forming the historic centre. Cienfuegos tourist information is best gleaned from your hotel reception or at one of the city's travel agencies, such as Cubatur on Calle 37 (the Paseo del Prado), or either Cubanacan or Havanatur, both of which are located on Avenida 54. If you are in the mood for a golden sandy beach, then the nearest is the Playa Rancho Luna, which is just a relatively short drive to the south and usually quite uncrowded. Scuba diving opportunities are available here, although better at Ensenada de Barreras and Las Playitas. Cruises, fishing trips, mountain roads and a waterfront promenade (the Paseo del Prado / Malecon) all mean that there is plenty to fill your day with. Offering all the charm of a traditional Victorian theatre, the Tomas Terry Theatre (Teatro Tomas Terry) lies in the centre of Cienfuegos and regularly stages all manner of shows and evening performances, while the nearby Soledad Botanical Gardens (Jardin Botanico Soledad) is the perfect place to head on a sunny afternoon, with its exotic flowers and interesting history, being founded at the turn of the 20th century on the fortunes of a wealthy American. More information about Cienfuegos Tourist Attractions. Cienfuegos was officially established in 1819 and at around 200 years old, comes with a number of interesting historic landmarks, which in 2005, earned the city a UNESCO World Heritage listing. As you explore the city, you will find that there are really two main regions, the colonnaded centre and the Punta Gorda area, where a series of palaces date from the 20th century, such as the rather elaborate Palacio de Valle. Standing alongside the Parque Jose Marti is the Casa de la Cultura Benjamin Duarte (formerly the Palacio de Ferrer), which features a dome-shaped cupola and superb cityscape views. Just a stroll away is the Catedral de la Purisima Concepcion (Cathedral of the Most Pure Conception), which is now more than 150 years old and known for its two towers (one tall, one short) and French stained-glass windows. More information about Cienfuegos Landmarks and Monuments. The few cultural attractions and museums in Cienfuegos are not really a big tourist magnet, although can be quite interesting if you are looking for something to do. The National Museum of Naval History (Museo Historico Naval Nacional) is amongst the best on offer and comes with information about past Indian tribes and various archaeological artefacts. At the Provincial Museum (Museo Provincial), the more than pleasant views over the Parque Jose Marti are almost more appealing than the exhibits themselves. Next door to the Polivalente Sports Centre is the Polivalente Sports Museum, where much memorabilia relating to Cuban sports is showcased. More information about Cienfuegos Museums and Cienfuegos Art Galleries. Driving along the surrounding Cuban highways is likely to be a real highlight of any holiday in Cienfuegos and day trips are always popular. For families, an excursion to the nearby Delfinario (Dolphin Centre) really is a must and visitors can expect regular shows with performing dolphins and sea lions, although it is a little commercialised. To experience Cuban nature and wildlife at its very best, then the jungles and mountains at the Topes de Collantes National Park (Gran Parque Natural Topes de Collantes) should be explored. To the south-east is the town of Trinidad, which is reached by a scenic road offering glimpses of the Escambray Mountains and the Caribbean coastline. Cienfuegos tourists may also like to check out the friendly north-easterly town of Santa Clara, where renowned Cuban revolutionary Che Guevara is buried, or perhaps the Jagua Fortress (Nuestra Senora de los Angeles de Jagua). 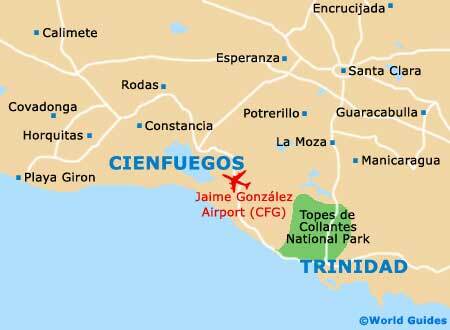 More information about Cienfuegos Attractions Nearby.